You can use REST services for communication between components. For example at clean/deploy configuration, the Configuration service is used to clean/update the configuration for a component. This sections lists the REST services available in InterPlay. For details about REST services parameters, the InterPlay RESTful API documentation can be found at http://<host>:<port>/interplay-web/api/v1/ui. All REST services can be tested using the Swagger UI at http://<host>:<port>/interplay-web/api/v1/ui or at http://<host>:<port>/interplay-web/swagger-ui.html. Datastore Client provides RESTful API to allow external systems to send REST calls for various tasks like injecting/extracting data from the database and managing Datastore Runtime components configuration. For details about REST services parameters, the Datastore Client RESTful API documentation can be found at http://<host>:<port>/dsclient-web/apidocs. All REST services can be tested using the Swagger UI at http://<host>:<port>/dsclient-web/apidocs/ui. inject – used to inject data into Datastore. You can find the contents of the file attribute at http://localhost:8080/dsclient-web/download/005169635k4mwtwi9v5kjasg2q46r07s4qm61y2. It can also be sent to other services on the network. 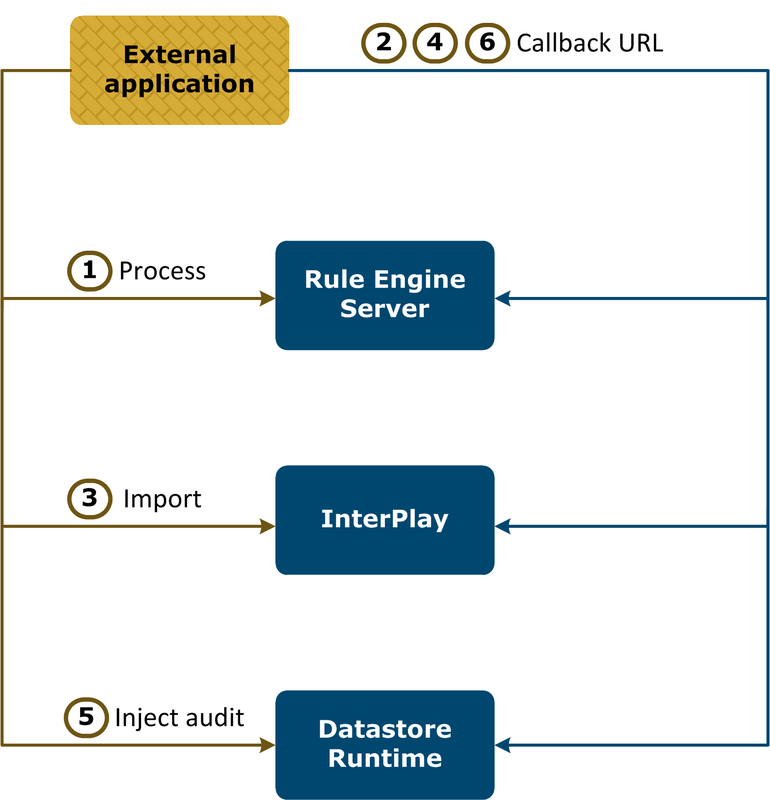 Rule Engine Server provides RESTful API to allow external systems to send REST calls for Rule Engine process operations, and status. For details about REST services parameters, the Rule Engine Server RESTful API documentation can be found at http://<host>:<port>/resrv-web/apidocs. All REST services can be tested using the Swagger UI at http://<host>:<port>/interplay-web/apidocs/ui. 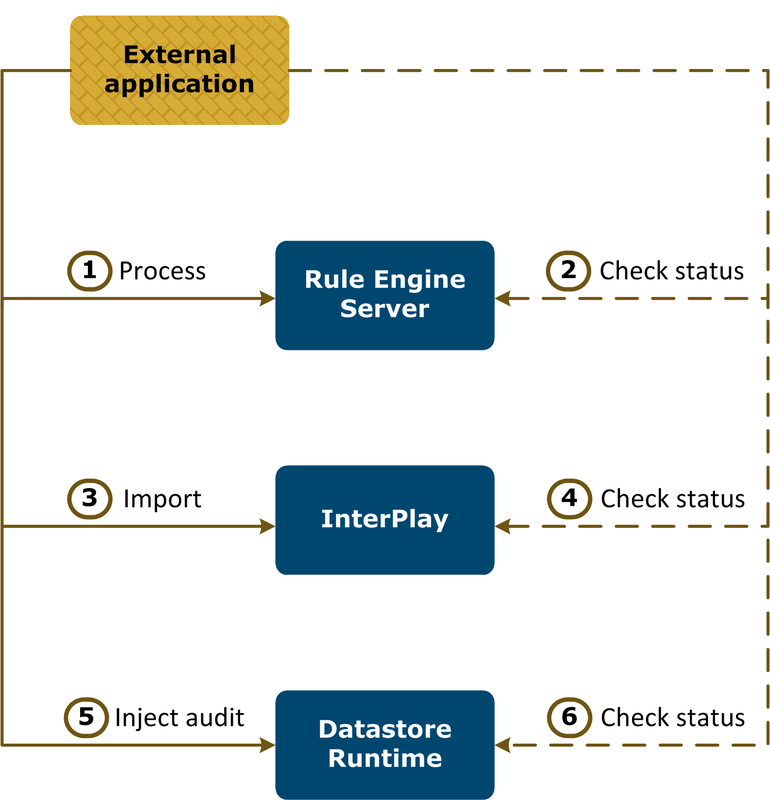 RuleEngineProcessRest – used to make a Rule Engine process operation. The contents of the inputTraceResult can be accessed at https://localhost:9081/resrv-web/download/001226098n95o1hr67e27iftqlvbf9 and it can be sent to Datastore Client for injection. POST – A POST request on the Deployment service URL creates a deployment package and saves it to <WorkDirectory>/deploymentPackage/. Additionally, it can publish the deployment package to Repository. For details about REST services parameters, see the Designer RESTful API documentation at http://<host>:<port>/designer-web/apidocs. All REST services can be tested using the Swagger UI at http://<host>:<port>/designer-web/apidocs/ui. All REST services can be tested using the Swagger UI at http://<host>:<port>/aisadmin-web/apidocs/ui. GET – request on this URL starts a list of sessions for a given user name. DELETE – request on this URL starts a delete of all sessions for a given user name. DELETE – request on this URL starts a delete of a session for a given user name and session identifier. The request is processed and the response contains an export task identifier and the URL from where the status of the operation can be retrieved. The path from the response can be used to download the generated files. The task status can be checked using resourceURI from the response: http://<host>:<port>/resrv-web/api/v1.0/process/315166. The task status can be checked using resourceURI from the response: http://<host>:<port>/dsclient-web/api/v1.0/inject/315166. Note In case of a DELETE request, the callback URL can be set in a query string (responseUri) or in the header (X-Response-URI). For REST requests that do not specify a destination directory, the generated files, if any, are stored in a temporary directory that is automatically generated . The REST response contains the URLs of the produced files and the client can download them by accessing the URLs. The client can remove the files after download by performing a DELETE request to the given URLs. However, if the files are not manually removed, they are automatically cleaned-up after they expire. The generated temporary directories are removed as well when they are empty. The names of the automatically generated temporary directories follow a specific pattern, specified in Administration > General Settings. Example of pattern for temporary folders: temp_*_ais. The * character is replaced with the current date and time. In this case, the name of an automatically-generated temporary directory could be: temp_2015_03_14_09_26_53_589_ais. After getting this response, you can either use the internationalized message or internationalize the message using errorCode and parameters. Send a process REST request to Rule Engine Server. In response, you get the task identifier and the URL to be used for checking the status of the task. When the task is finished, you receive the process result. Send an import reject files REST request to InterPlay. When the task is finished, you receive the import result. Send an inject audit trace files REST request to Datastore Runtime. In response, you get the task identifier and the URL to use for checking the status of the task. When the task is finished, you receive in response the inject result. The request contains the callback URL used by theRule Engine Server to send back the process file result. After the process file task is finished, a POST request with the result is performed on callback URL. Send an import-reject-file REST request to InterPlay. After the import file task is finished, a POST request with the result is performed on callback URL. Send an inject-audit-trace-file REST request to Datastore Runtime. After the import-file task is finished, a POST request with the result is performed on callback URL.